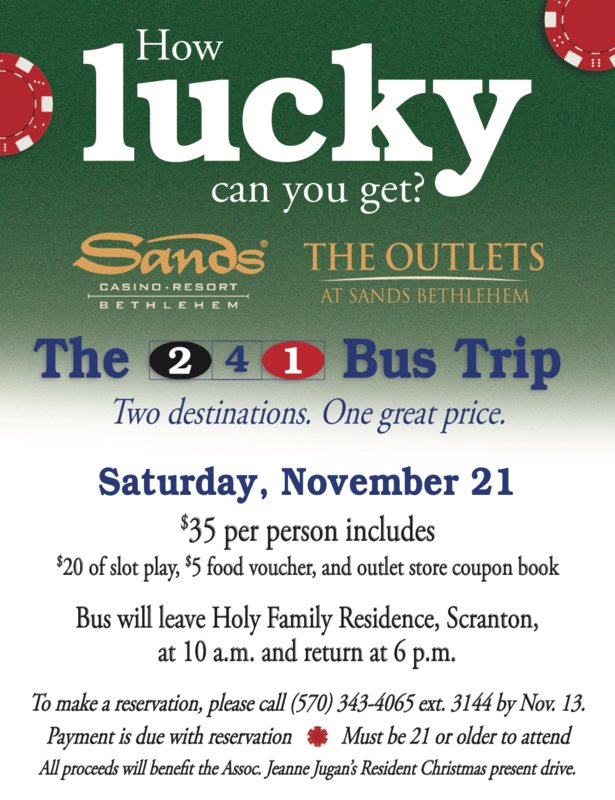 The members of the Association Jeanne Jugan of Holy Family Residence will sponsor a bus trip to the Sands Casino and Outlet Shopping complex, Bethlehem, on Saturday, Nov. 21. The bus, which will be provided by Martz Trailways, will leave the parking lot of the residence, 2500 Adams Ave., Scranton, at 10 a.m. and return to the residence at 6 p.m. All bus ticket proceeds will be donated to the Little Sisters of the Poor to purchase Christmas gifts for the residents of Holy Family Residence. Bus tickets are $35 which includes $20 of slot play, a $5 food voucher and a coupon book for the outlet stores. To make a reservation please contact Mrs. Jackie Galvin, M.S., director of development and communications, at (570) 343-4065 ext. 3144 or scdevelopment@littlesistersofthepoor.org by Nov. 13. Attendees must be 21 or older to attend. Valid photo ID required.